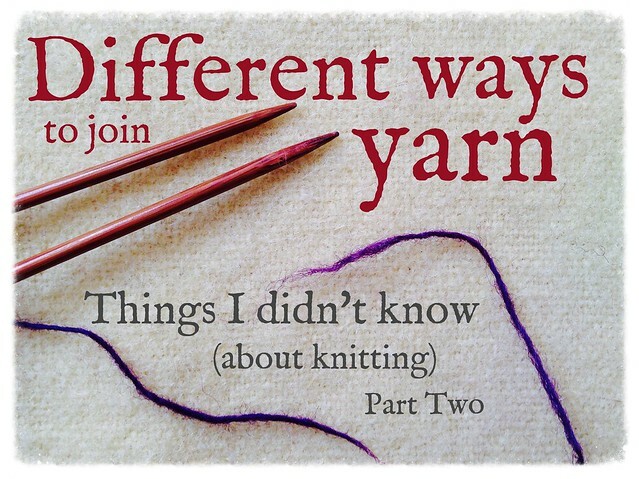 There are so many things that I don't know about knitting, and each time I think I have something sussed, I discover there's a whole selection of different techniques I haven't heard of. Take joining new yarn (at the end of a ball or for a colour change) as an example. Selvedge: When I first started knitting, I only knew about knitting flat and joining yarn at the beginning of a row so the ends could be hidden in the seam. Simple. Except it wasn't quite so simple, because sometimes every scrap was precious and I didn't want to waste yarn that wouldn't make it to the other side of the work and so it joining in the midst of a row was necessary on occasion. Double Yarn: When I started working in the round, seams were no longer an option but I didn't want to see the join or to weave-in ends on a visible section of a garment. I tried knitting both yarns double (with the ends in opposite direction) for a small section before switching to the new yarn, but this left one bulky row in the knitting, and there were still two ends to deal with. ... but the Russian Join isn't perfect for all yarns, and sometimes there isn't always a tapestry needle to hand. Splicing: When I wrote about the Russian Join, a few readers recommended Spit Splicing wool yarns, which is essentially a felted join. I know some people love it, but I really don't like this one so much. Perhaps it's the spitting thing, or perhaps it's because it's really quite fiddly. This looks super... but the comments on this video are quite varied. People seem to either love this method or hate it. It seems to depend on the type of yarn being used, whether it will be machine washed and how the fabric will be treated. I don't think I'd trust my thinnest handspun to this method, but can see that it would work for lots of other yarns and am keen to give it a try. These days, when I have a knitting question I consult June Hemmons Hiatt for guidance and when I did this, discovered a few more options including the Twined knit tie-on (alternating stitches from each yarn rather than using both together as in double yarn variation, borrowed from Twined knitting) and Purl Inlay tie-on (borrowed from the purl inlay colour technique where the ends are weaved in as you knit). Unfortunately, no matter how you join the yarns or weave the ends into fabric, the last little bit may refuse to stay put because the fabric is stretchy. I have yet to find any solution to this short of acceptance - hide most of the end using whatever method you choose, and cut the rest off. So which technique do you use most often? Are there any you don't get on with? I'd love to know. Since I primarily use wool yarns, the felted/spit-splice join works just fine for me. You can use water, too, it doesn't have to be spit! But since discovering the magic knot recently it's become my favorite, especially for silk blends that don't felt together. I find the knot is barely noticeable in the finished fabric and it eliminates all ends and areas of double thickness. Double knot for me every time. I have tried splicing when using wool yarn but I just can't get it to work. I mostly use the double.knot method. Russian can be hard to weave in the end into the yarn. I use Russian join even if the end doesn't always stay put. It's a lot more reliable than the double knot.